Product #17854 | SKU DWRS02DE42 | 0.0 (no ratings yet) Thanks for your rating! 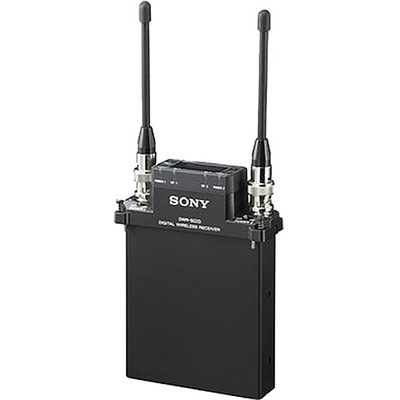 The Sony DWRS02D/14 Dual Channel Digital Wireless Receiver is a digital dual-channel slot-in receiver. It operates within the 72 MHz range, from 470 to 542 MHz. The slot-in receiver can be mounted directly onto Sony digital slot-in compatible camcorders; the receiver then facilitates 2-channel wireless operation with unique wireless remote control of the digital wireless system from the camera viewfinder. It can also be mounted on existing cameras (or operated in a mixer bag) using the DWA-01D or DWA-F01D adapters, providing either AES3 digital audio or analogue audio output. To assist in the wireless system set-up, the receiver includes both clear channel and active channel scan functions.